State wildlife departments and local fishery managers set minimum length and slot limits to maintain healthy fish populations and improve angling opportunities. Knowing these rules and regulations and having an accurate fish ruler close at hand are important for staying within the rules and regulations that govern an angler’s body of water. Minimum length limits prohibit the harvest of a fish that falls below the minimum length. For example, Texas’ minimum length limit for largemouth is 14 inches. Any fish that measures below 14 inches must be released back into the water. Daily limits also control how many of a certain species can be harvested within a given day. In Texas, the daily bag limit of black bass is five. Slot limits create an interval to protect fish above or below certain lengths. In Louisiana, a redfish measuring between 16 inches and 27 inches can be harvested with a daily limit of five. Of those five fish only one can measure over 27 inches and is known as an “over.” By contrast, Texas’ slot limit for redfish is 20 to 28 inches with a daily bag limit of three including one “over” per year and must be properly tagged. State game laws for fishing can vary by region as well. Daily limits on spotted sea trout in Matagorda County, (TX) change according to if you are north or south of Farm to Market (FM) 457. There are also regulations controlling what methods certain species can be caught or change limits due to the time of the year and estimated species populations. Knowing the current laws and regulations is key to maintaining healthy populations and staying on the good side of wildlife officers who often check an angler’s livewell or stringer. Using an accurate fish measurer or fish ruler is key to a proper harvest. The updated and improved YakGear Fish Stik Folding Fish Ruler offers anglers a tool to quickly and efficiently measure fish lengths. The 36-inch ruler features raised, quarter-inch increments for precise measurements and folds down to 12 total inches. Constructed of a proprietary blend of plastics, the Fish Stik’s newly-fortified locking tabs create a straight and rigid platform that can be used while spanning an angler’s lap and can easily be unfolded with one hand. The Fish Stik also floats so anglers can measure fish while still in the water and also prevents loss of the ruler if dropped in the water. The Fish Stik also comes with an included permanent marker so anglers can mark their local length limits. 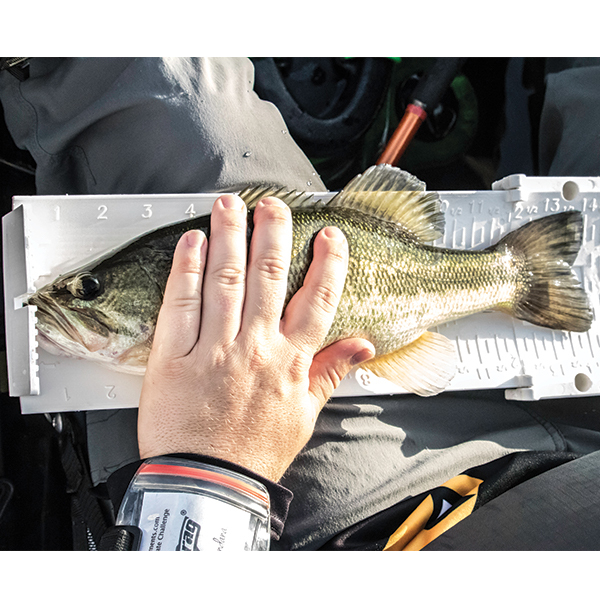 For competitive anglers, integrated bump board grooves have been added for catch-photo-release tournaments and has been approved for use on the Kayak Angler’s Tournament Series (KATS) and the Kayak Bass Fishing (KBF) tournament series. Be sure to look up your state and local fishing regulations before heading out and never get on the water without a fish ruler.